This MANAGEMENT AGREEMENT (the “Agreement”) is dated as of _____________, 20__ between HEALTHCARE PROPERTIES HOLDING COMPANY, a ___________ limited liability company (“Company”), and HEALTHCARE PROPERTY MANAGEMENT, INC., a ___________ corporation (“Property Manager”). Company owns certain real property and improvements located at _________________________________, commonly known as ____________ Rehabilitation Complex, as more particularly described in Exhibit “A” attached hereto and incorporated herein (together the “Property”). 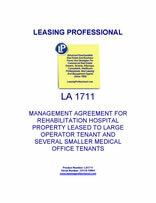 A portion of the Property is (a) currently leased pursuant to that certain Lease Agreement dated ______, 20__ by and between Rehabilitation Specialists, LLC, a ________ limited liability company (“Tenant”) and the Company (as landlord), together with all associated amendments, modifications, extensions or supplements thereto and as may be amended (the “Lease”). 1. COMMENCEMENT AND TERMINATION DATES; AUTHORITY OF COMPANY. 1.1 Commencement and Termination. Property Manager’s duties and responsibilities under this Agreement shall begin on ___________, 20__ (the “Start Date”) and shall terminate on the earlier of (i) the sale of the Property or any portion thereof, but only as to such portion of the Property sold, (ii) termination as provided in Section 10.1, or (iii) _________, 20__. 1.2 Approval of Company. Whenever in this Agreement the consent or approval of Company is required or otherwise requested, Company shall have fifteen (15) days after the date on which the request for consent or approval is submitted to it by Property Manager in which to approve or disapprove of the matter in writing (unless a longer or shorter period for response is expressly provided for herein). If Company does not disapprove of the matter within such fifteen (15) day period (or such longer or shorter period expressly provided for herein), the matter shall be deemed to have been approved. 1.3 Operating Agreement. Property Manager acknowledges that (a) Property Manager has knowledge of the requirements under the Limited Liability Company Agreement of the Company dated on or about the date hereof (as may be amended from time to time, the “Operating Agreement”) for obtaining the consent or approval of the Executive Committee (as defined in the Operating Agreement) with regard to Major Decisions (as defined in the Operating Agreement) and all other actions requiring Executive Committee approval in accordance with the Operating Agreement, and (b) Property Manager has received a copy of such Operating Agreement. 2.1 Status of Property Manager. Company and Property Manager do not intend to form a joint venture, partnership or similar relationship. Instead, the parties intend that Property Manager shall act solely in the capacity of an independent contractor for Company. Nothing in this Agreement shall cause Property Manager and Company to be joint venturers or partners of each other, and neither shall have the power to bind or obligate the other party by virtue of this Agreement, except as otherwise expressly stated herein with respect to the powers of Property Manager. Nothing in this Agreement shall deprive or otherwise affect the right of either party to own, invest in, manage, or operate, or to conduct business activities which compete with, the Property. 2.2 Management. To the extent required pursuant to the to the terms of the Lease and subject to Section 1.3 of this Agreement, Property Manager shall manage, operate and maintain the Property in an efficient, economic, and satisfactory manner and shall manage the performance of everything reasonably necessary for the proper operation of the Property for the tenants thereof, subject to (a) applicable governmental requirements, and (b) the terms and provisions of this Agreement. At the expense of Company, Property Manager shall keep the Property clean and in good repair, shall order and supervise the completion of such repairs as may be required and shall generally do and perform, or cause to be done or performed, all things necessary or required for the proper and efficient management, operation, and maintenance of the Property, provided Company, in a manner reasonably satisfactory to Property Manager, makes available to Property Manager sufficient sums to pay the costs thereof. Property Manager shall perform all services in a diligent and professional manner. 2.3 Employees/Independent Contractors of Property Manager. Property Manager or an affiliate shall employ, directly or through third-party contractors (for example, an employee leasing company or on-site property manager), at all times, a sufficient number of capable employees and/or independent contractors to enable Property Manager to manage, operate and maintain the Property in a manner that is proper, adequate, safe and economical in accordance with Company’s obligations under the Lease. All matters pertaining to the supervision of such employees shall be the responsibility of Property Manager. All salaries and benefits and positions of employees who perform work in connection with the Property shall be consistent with the Budget (as defined in Section 2.5). 2.4 Compliance with Laws, Mortgages and Other Matters. (a) Property Manager shall use reasonable efforts to comply with all applicable governmental requirements, including by way of illustration, but not limitation, the Board of Fire Underwriters or other similar body, relative to the performance of if its duties hereunder, and cause the Property to comply with all applicable governmental laws, ordinances, rules, regulations, and requirements. Property Manager shall implement such procedures with respect to the Property as Property Manager may deem advisable for the more efficient and economic management and operation thereof. Property Manager shall pay from the Operating Account (defined in Section 6.1) expenses incurred to remedy violations of laws with respect to the Property, to the extent not paid by Tenant. Property Manager shall not be obligated to remedy such violations of law if sufficient funds are not available in the Operating Account or if Company does not provide sufficient additional funds to do so, unless such violations of law arise out of the gross negligence or willful misconduct of Property Manager. (b) Property Manager shall furnish to Company, promptly after receipt, any notice of violation of any governmental requirement or order issued by any governmental entity, any Board of Fire Underwriters or other similar body against the Property, any notice of default from the holder of any mortgage or deed of trust encumbering the Property, or any notice of termination or cancellation of any insurance policy. (a) Property Manager shall prepare and submit to Company, upon written request, an initial capital and operating budget (“Budget”) for the promotion, operation, leasing (including leasing parameters for the Property), repair, maintenance and improvement of the Property for the first full calendar year of ownership on or before ___________ of the calendar year in which the Property was acquired. The Budget shall be on a monthly, generally accepted accounting principles in the United States (“GAAP”), basis. Property Manager shall also deliver a Budget for each subsequent calendar year on or about _____________ of the calendar year before the budget year. The Budget shall be approved by Company. Company shall be deemed to have approved the Budget unless the Company provides written notice to Property Manager indicating specific objection to certain Budget items within fifteen (15) days from receipt of the Budget. In the event Company disagrees with any item in the Budget, the Property Manager may proceed under the terms of the previous year’s Budget and may take any action with respect to items not approved for Emergency Expenditures (as defined in Section 2.5.2) until such time as the new Budget is approved. Property Manager shall provide Company with such information regarding the Budget as may be, from time to time, reasonably requested by Company. Property Manager may at any time submit a revised Budget to Company. (b) Property Manager shall charge all expenses to the proper account as specified in the Budget, provided that Property Manager may reallocate savings from one line item to other line items, so long as not more than five percent (5%) of the amount of any line item is reallocated in any calendar year. Property Manager shall submit a revised Budget to Company prior to making any expenditure not within the Budget unless the expenditure is (a) less than Five Thousand Dollars ($5,000), or (b) in the Property Manager’s reasonable judgment, required to avoid personal injury, significant property damage, a default under any loan encumbering the Property, a violation of applicable law or the suspension of a service (collectively, “Emergency Expenditures”). (c) During each year, Property Manager shall inform Company of any material increases in costs and expenses not foreseen and not included in the Budget within a reasonable time after Property Manager learns of such changes. (d) Together with the submission of the Budget, Property Manager shall submit each year to Company, for informational purposes only, an operating plan for the general operation of the Property, including a proposed list of improvements to the Property, general insurance plan, marketing plan and plan for the general operation and maintenance of the Property (the “Operating Plan”). Property Manager may submit a revised Operating Plan to Company at any time.